As we make an effort to fight for women’s rights here in America regarding topics such as fair pay, we must take a moment to acknowledge the struggle for women to gain civil rights all over the world, particularly those in Nigeria, Â who are still mourning last years abduction of 219 Nigerian schoolgirls. 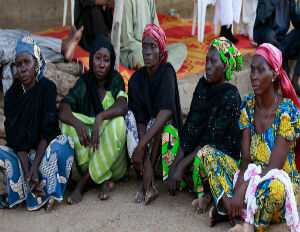 The mass kidnapping of 276 girls on April 14, 2014, from a boarding school in the rural town of Chibok in northern Nigeria sparked international outrage and condemnation of the Boko Haram group that carried out the attack. While some of the girls made it home by escaping their captors and walking days through the desert to freedom, 219 have never been rescued. Throughout the past year people took to social media to express their intolerance and disdain for the girls captors and also to show that the Nigerian schoolgirls have not been forgotten. Leaders like, Malala Yousafzia, 17 year old Pakistani activist for female education and the youngest-ever Nobel Prize laureate, also turned to the internet to reassure the missing girls that she too keeps them in her thoughts. “Please know this: We will never forget you.â€, said Yousafzia, lending her voice to the cause in an open letter to the schoolgirls.